One of the best things you can do for your son or daughter during their weekend-long tournament is to keep them properly hydrated and energized. This doesn't mean loading them up on Gatorade and Red Bull but finding a healthy nutrition balance to make sure they are optimizing their performance. Keeping your player performing their best only takes a large cooler and a little planning ahead. This article will illustrate the best food and drink combination to pack for your son or daughter and keep them playing at their highest level. Food selection is extremely important, especially for long tournaments during hot summer months. Small changes in food choices can lead to huge improvements in performance and recovery. For example, choosing foods that are rich in healthy fats such as tuna, almonds, and walnuts can help to drastically reduce inflammation in the body. This reduces muscle soreness allowing your player to bounce back game to game quicker. Furthermore, eating high-quality protein sources like whey protein isolate, turkey/chicken, and eggs can provide high levels of the amino acid leucine which will aid in a quicker recovery. Again, all this takes is a little planning ahead. Going through a fast food drive-through in between games not only is bad for nutrition but greatly impacts the players' performance and energy levels. it’s imperative to consume adequates amount of calories/energy from a variety of both fast and slow acting carbohydrates. For a nutritious sports drink, I recommend Karbolyn Hydrate by EFX Sports. It contains an ample amount of carbohydrates that elevate blood sugar quickly. This gives the player natural energy, while also providing the body with a proper ratio of electrolytes. Pair this with proper amounts of water and you can ensure that your player maximizes their performance all weekend long. Try to stay away from feeding your athlete(s) foods that sit heavy in their stomachs or are calorically dense, while not providing adequate levels of nutrition. Foods like candy, soda, chips, and peanut butter are not suitable for performance or recovery and can leave your athletes feeling sluggish and even nauseous, simultaneously leaving them without the right amount of calories and nutrients needed for optimal performance and recovery. Screenshot this picture for a quick reference! 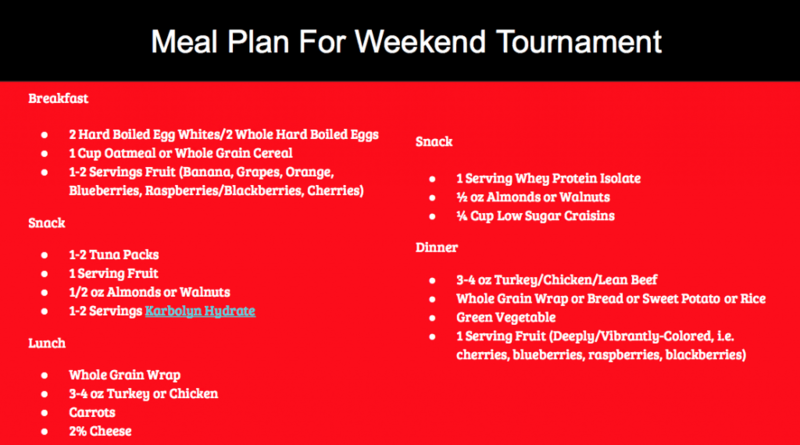 Obviously, providing your athlete with a meal plan like this take time and effort. But consider this an additional investment into your child's development. We have no issue going out and buying the latest $400 bat if we think it's going to help our kid hit the ball farther. If you have a cooler and one hour a week you can help provide a nutritious meal plan for your athlete so they don't skip a beat come tournament time.